11.11. 2010 – 16.01. 2011 opening Thursday 11.11. 8 pm. Babi Badalov is an artist and poet. His visual poetry very often takes the form of a diary, created every day through a combination of his own linguistic research of manipulated pictorial material, mainly with political content. He uses drawing to complete various collages on pages, often organized into books. In writing, Badalov uses a combination of Cyrillic and Latin characters and those of all languages that he knows – from Persian to Russian to English and French. A record is very often maintained through a phonetic logic, then creating unexpected combinations and word play that are possible owing only to such radical means. The drawing often blends with the writing creating a collage, sometimes as though it overflows and fills the format in an unexpected horror vacuum. Very often this consists of ironic political commentary, ridiculing policies and social events, integration processes and mainly the EU asylum policy with which the artist has sufficient experience. Babi Badalov was born near the Iranian border in Azerbaijan, but has lived the life of a nomad in recent years, partially forced, when through various reversals in fortune he ended up in France, where he is now requesting asylum as a political refugee, and partially from the longing to live in an open society without prejudices where he can be a poet without having to worry. 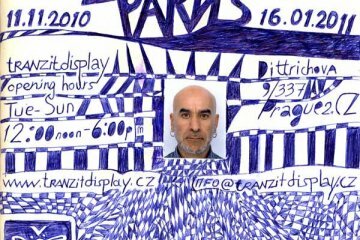 Babi Badalov decided to exhibit at tranzitdisplay his visual diary from asylum homes and from his current home – the streets of Paris. Unfortunately, due to the very strict terms for granting asylum in France he cannot attend the exhibition personally. 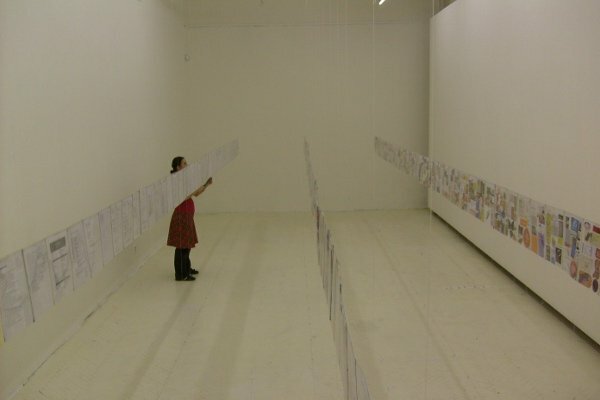 The linearly installed double-sided A4 pages guide us through the latest extremely depressing eight months of the life of a person who awaits in fear and frustration for “redemption“ in the form of civic identity mediated by the authorities. On the one hand, we see the endlessly long communication with the bureaucratic system that endeavours to encumber as much as possible the granting of asylum and, on the other hand, we see a schematic collage from pieces of printed and signed papers, transportation tickets and product packaging that are traces of human existence on the edge of society. Babi Badalov (*1959, Lerik, Azerbaijan), is an artist and poet living in Paris. 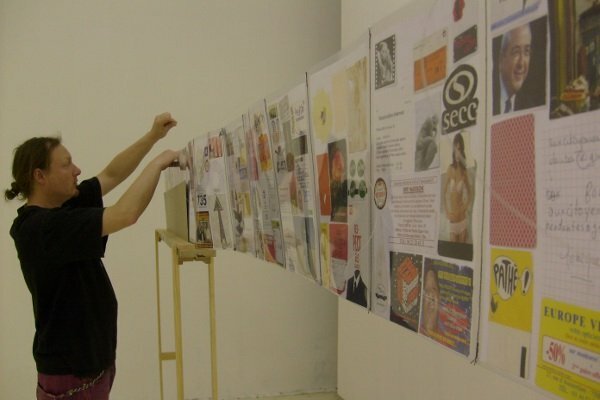 He has exhibited in Thessaloniki, Tallinn, Athens, Amsterdam, San Francisco, Istanbul, St Petersburg, Dresden, Cardiff, and Milan. His works have been collected in museums and private collections such as the Russian Museum, St Petersburg; Azerbaijan State Museum of Art, Baku; Museum of Art, Emden, Germany; and Martigny Art Museum, Switzerland, and Museum of Modern Art in Antwerp, previously MuHKA.